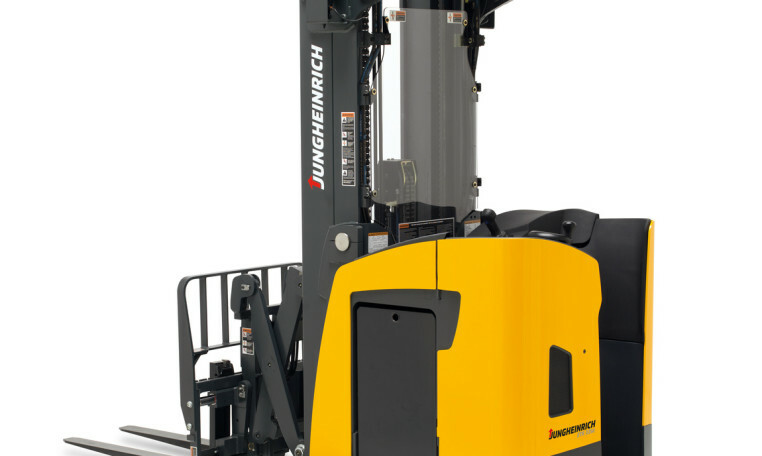 The Jungheinrich ETR 340-345-335d series of moving mast reach trucks offer the right solutions for a wide range of applications. The reach trucks come equipped with premium ergonomics and standard features that help increase operator confidence and improve productivity in your warehouse. For deep (2 pallets depth) reach applications (ETR 335d only) at lift heights of more than 10 m the residual capacity is well above 1000 kg. Remarkable energy efficiency is accomplished by a perfectly balanced setup of all powertrain components as well as the sophisticated Jungheinrich AC technology. This enables operators to run two consecutive shifts on a single battery charge. The basic capacity of 1600 kg is available for shelf heights of up to 10 m - even on the back shelf. At the maximum lift height of 11.35 m loads of more than 1360 kg can be still handled in deep reach applications.